A revitalization project to convert an old industrial building to a commercial office building. This is a challenging site with no natural light, numerous beams and a very low ceiling. 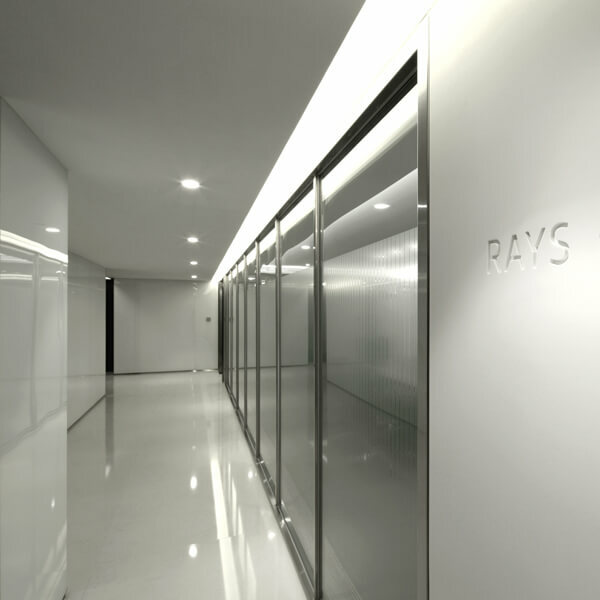 Light troughs are evenly distributed throughout the ceiling and extending to the surrounding space to conceal the numerous ceiling and floor beams with a concept of sustainability and continuity. The location of the reception area is carefully designed to surround the existing square column to make it feel like a whole tailor made unit. As the ceiling heights are low, we used a number of design features to create an illusion of height. e.g., we lowered the reception counter tops and used wooden stripes to lengthen the look of the walls. Varying the width of the coloured glass wall resonate the theme of lines and functions to hide the service doors. Mirror used at ceiling making the ceiling visually higher. A revitalization project to convert an old industrial building to a luminous commercial office building.